part of a $4,000 grant to the Ogden Nature Center. 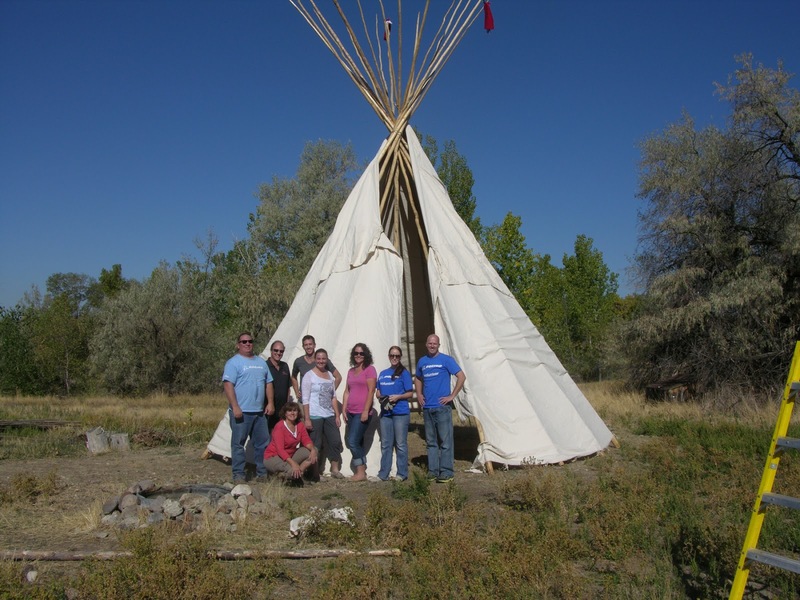 The Boeing Company has donated $4,000 to the Ogden Nature Center to purchase a new teepee for its Native American historical display and binoculars for its Birds program. Last year, the Ogden Nature Center’s teepee was damaged during a storm and needed to be replaced. Boeing purchased the new teepee for the Living Close to the Land program. One of the Ogden Nature Center’s most popular education programs, the Living Close to the Land program takes children back in time to explore the lives of Native Americans. Children sample cornmeal "journey cakes," learn about medicinal and material uses of plants, and spend part of their time in a teepee. Boeing employees had the unique opportunity to set up the new teepee for this year’s program. In addition, Boeing purchased binoculars for children who participate in the Ogden Nature Center’s Birds program. The Birds program teaches children how to identify birds, bird watching techniques, and how to recognize bird vocalizations. Children also learn about the importance of habitat for birds. The Ogden Nature Center is a 152-acre nature preserve and education center. Its mission is to unite people with nature and nurture appreciation and stewardship of the environment. Boeing is the world’s leading aerospace company and the largest manufacturer of commercial jetliners and military aircraft. Additionally, Boeing designs and manufactures rotorcraft, electronic and defense systems, missiles, satellites, launch vehicles and advanced information and communication systems. Headquartered in Chicago, Boeing employs more than 170,000 people across the United States and in 70 countries. Boeing has workforce of nearly 800 employees in Utah.